Bible Films Blog: Paul, Apostle of Christ set for 2018 release. Paul, Apostle of Christ set for 2018 release. Regular readers may have noticed that I've been trying of late to keep to a more consistent posting pattern. The downside of this is that there are times when it's been tempting to bang out a number of posts in quick succession, but I've held back, and this is one post that has rather suffered. 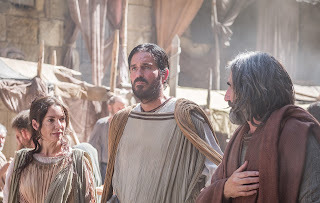 Anyway, just in case hasn't already read about this at FilmChat, Affirm Films, who are the faith-based branch of Sony have announced that they are currently filming a new movie about the apostle Paul due for release next year. Affirm are also currently putting the finishing touches on The Star ahead of its 10th November release later in the year. From the sound of the plot summary it seems to me like the earlier scenes will be shot in flashback from Paul's final days in prison, but perhaps I'm reading in too much.That would certainly correspond with writer/director Andrew Hyatt last film Full of Grace (2015) which covered the final days of Jesus's mother Mary. As Peter points out this will be something of a first. Whilst Paul has appeared on the big screen many time before, not least in epics such as Quo Vadis (1951) and early silent films about him, I think this is probably the first time he's been the star of a feature length film that has gained a significant cinematic release.And of course this film was announced just days before the death of one of the more famous actors to portray him, Harry Dean Stanton (in 1988's Last Temptation of Christ). So I'll be keeping an eye on this one. Hopefully it will get a UK release. Any idea where in the North East of England this movie is showing? Sorry, totally missed this post before. Did you manage to find anywhere near you that screened it? It's due out on DVD soon if you'd still like to see it.